Alterations and More, located at 1440 Diederich Blvd., in Flatwoods, Kentucky, transforms mass-produced “ready-to-wear” garments into individualized, perfectly fitting items — offering alteration services for men’s and women’s clothing and formal wear. 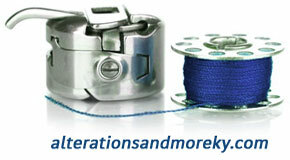 One size does not fit all with Alterations and More. Customers will come in with ready-to-wear and leave with ready-to-fit clothing. The owner and founder of Alterations and More, Alfreda Moore began sewing at the age of seven, and by high school was making her own clothes. She is a member of the American Sewing Guild and has studied under notable designers and seamstresses including Susan Khalge, of Washington D.C. She regularly attends professional classes and fashion shows to stay on top of new trends and methods.